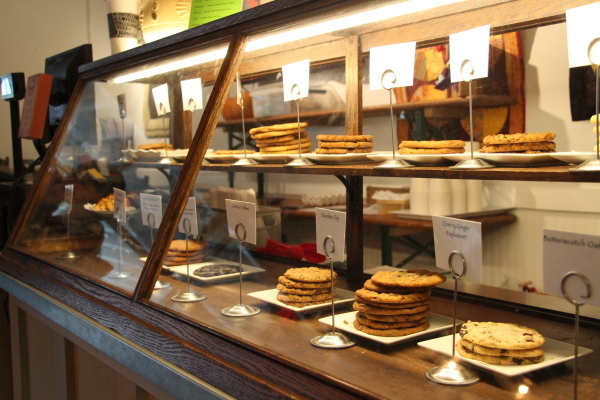 Located in Buckhead, The Cookie Studio offers some of the area’s best coffee and pastries. When looking for an exceptional place to satisfy your sweet tooth, an eatery off Peachtree presents expertise and passionate care in each bite. The Cookie Studio is located on Pharr Road, not far from The Buckhead Theatre. The shop offers cookies, cupcakes and various sweet treats to customers. A few years ago this time, owner Barbara O’Neill never would have guessed she’d have her own bakery. Before opening the bakery, Barbara was working as a full time volunteer at the Atlanta Day Shelter for Women and Children. Having worked for ten years in New York doing computers for a law firm, she wanted a change of pace. That was in 2005 and in succession The Cookie Studio was officially opened in 2007. For a period of time, the profits of The Cookie Shelter were partially donated to the Atlanta Day Shelter for Women and Children. However, the studio has been through a location change and the budget doesn’t currently allow for it. “My whole goal is to create a sustainable income for the shelter. My loyalty is to the shelter. I feel like it’s my mission to help sustain the shelter even though conditions have improved,” O’Neill said. The charitable aspect of The Cookie Studio does nothing but add to the delectable things they offer. Food and Wind Magazine accredited their chocolate chip cookie as “one of the best in the country.” Atlanta Magazine, Creative Loafing and the Atlanta-Journal Constitution have also all ranked The Cookie Studio’s cookies highly in their food issues. Another notable addition to the shop is that hopefully soon, a full-blown baking school will be launched. Those ideas include a gluten free baking class, a cookie decorating class, and a holiday class incorporating cookie recipes from around the world. However, the grueling nature of servicing people with solid product leaves little time to nail ambitious things at the bakery. “Just the other day, we had a call in order for 5,000 cookies. Especially with the holidays coming, more and more orders are coming in,” O’Neill said. The forefront aspect of The Cookie Studio’s appeal is the commitment to the community. Not only is the women’s shelter an important benefactor to them, but they donate to the community’s local schools, whether it’s through gift certificates or donations. With strong convictions and a clear image, franchising would be a common road for a popular brand like O’Neill’s. While it may seem easy, O’Neill has enough experience to understand that baking cookies isn’t all it seems. – Cookies are really susceptible to moisture and humidity. The temperature and location of the baking should always be a factor. – Cookies are sensitive to what flour is being consistently used. Cookies can be overcooked and undercooked very easily. “The majority of our cookies are baked within a 12 minute period, but some cookies have been cut and turned so the baking is more even no matter the oven either,” O’Neill said. – If you don’t combine the butter and sugar correctly, they will come out wrong and spread too much. – They have to be made with real butter. “You just have to. They can’t be made with margarine or shortening. It’s not the same,” O’Neill said. O’Neill’s cookies are named after and created by her late mother, Edie. 1. Line cookie sheet with parchment paper, place 1/2 sheet baking pan under cooling rack. 2. Mix flour and salt. Set aside. 3. Mix softened butter in mixing bowl until creamy. 4. Add sugar and blend completely. Stir in egg yolk and vanilla. 5. Add flour mixture, combine until just mixed. Then, place egg whites in a bowl. 6. Form dough into 1” balls.7. Drop dough ball into the bowl containing eggs whites and turn until moistened. 8. Remove cookies from egg white bowl and place on cooling rack to drain. 9. Place 1/2 cup of the chopped walnuts on cookie sheet, and then roll drained cookies in walnuts. 10. Repeat from step 9 down, until all dough has been used. Add additional walnuts as needed. 11. Place cookies on a parchment lined cookie sheet, and press your thumb indentation in center of each cookie. 12. Bake at 350 degrees for 6 minutes, and then turn cookie sheet and bake for an additional 6 minutes. 13. Allow cookies to cool. 14. Place jam in a pastry bag or a small zip lock bag with a small hole cut in one corner of the bottom of the bag. 15. Pipe the jam into the indentation you made in the cookie, squeeze enough jam into the indentation of each cookie to fill it up.